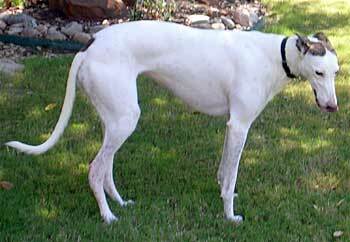 Liz, aka Pretty Liz, is a beautiful white and brindle almost 3-year-old female, born June 18, 2002. Her sire is My Rooster and her dam is Lidia Pretty, making her grand sire Molotov. 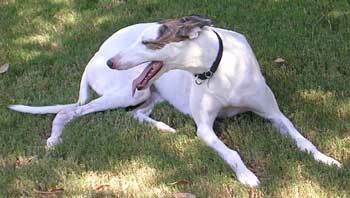 Liz's last race was February 25, 2005, at Valley Greyhound Park in Harlingen, where she suffered a nasty compound calcaneus fracture, which is a fracture of her heel, on her right rear leg. 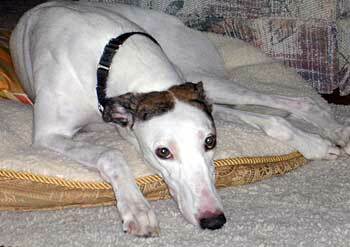 Liz was under the care of Dr. Marty Tanner, the greyhound injury specialist at Elgin, Texas. 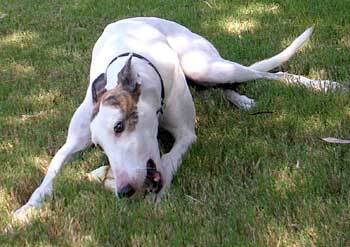 Because of the compound fracture, Dr. Tanner put her in an external fixator device. Dr. Tanner released Liz on July 12, and after her final medical procedures, she is ready to find her forever home. Liz is very sweet and loving. She is small animal and cat tolerant.